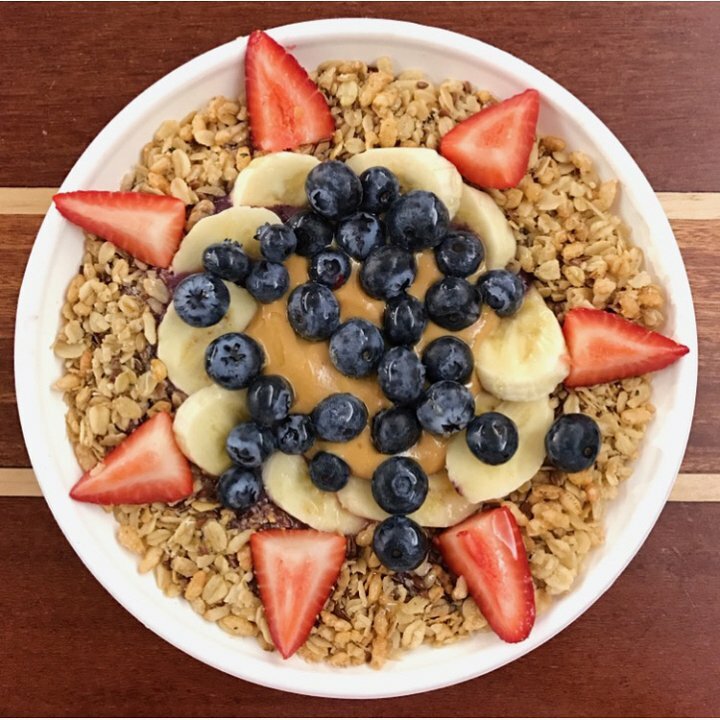 If only every day could begin with this delicious Protein Acai Bowl, with homemade peanut butter and fresh fruit over gluten-free granola. During a family visit, for two mornings in a row I kick-started my day with this dish, fresh from the Vela Juice Bar in Plymouth, Massachusetts — and it is SO much goodness! On a travel-related side note, Vela had celebrated their second birthday during our visit, and I could not be happier for them (or me)! I love finding tasty new juice bars when I travel, and that one’s a real gem, so if you’re in the area, consider yourself lucky and check them out! This recipe is from Vela Juice Bar. Top your gluten-free granola with homemade peanut butter, strawberries, blueberries, bananas and of course, acai berries. How many calories are in this protein bowl? Hi. Good question! I honestly don’t know… I don’t count calories and I didn’t make this bowl… It’s from the Vela Juice Bar in Plymouth MA… Sorry!